What, exactly, is Mitt Romney’s approach toward Asia and toward foreign policy more generally? That’s a difficult question to answer, as former Minnesota Governor Tim Pawlenty made clear. Pawlenty, an adviser who’s been mentioned as a possible Secretary of State should Romney win, was asked which school of thought Romney follows in foreign affairs. Will he tilt toward the traditional, realist Republican model? Will he follow the neoconservative school? Pawlenty, showing off his diplomatic skills, answered with a tautology: “I would put him in the Mitt Romney school,” he said. But that’s hardly an answer, and questions continue to swirl around Romney’s worldview. It’s a question that Romney himself might not be able to answer, just yet. Widely panned after a three-nation swing through Britain, Israel, and Poland in August, criticized for an earlier comment that Russia is America’s “No. 1 geopolitical foe,” many would argue Romney often seems out of sorts when it comes to global affairs. Such unforced errors on Romney’s part could mean that it’s way too early to wonder whether the former Massachusetts governor will, say, vigorously confront China on human rights issues and its currency and exports policy, as some in Romney’s camp favor, or instead give Beijing a pass, in keeping with the views of many of his big corporate backers who do business in China. To analyze Romney’s emerging foreign policy ideas, one might sift through Romney’s official campaign website (including its sections on Afghanistan and Pakistan, on China and East Asia, on Iran, and on Russia), the Republican party platform, and remarks by many of his team of foreign policy advisers. On nearly everything related to foreign policy, Romney draws a contrast between his belief in American “exceptionalism” and his readiness to act firmly and to pursue “peace through strength,” and President Obama’s alleged weakness, vacillation, and propensity to apologize to America’s enemies. In regard to China, Romney has insisted since the start of his campaign that one of his first acts as president would be to label China a currency manipulator and to impose tariffs on the import of Chinese manufactured goods. In a new campaign commercial, Romney accuses Obama of seven times refusing to “stop China’s cheating.” And the GOP platform, adopted at the convention in Tampa, says that China’s “manipulation of its currency [calls] for a firm response from a new Republican Administration.” Yet many previous candidates, including Bill Clinton and George W. Bush, talked tough about economic and human rights policy in China until taking office, and many business backers of Romney believe that he would follow suit if elected. 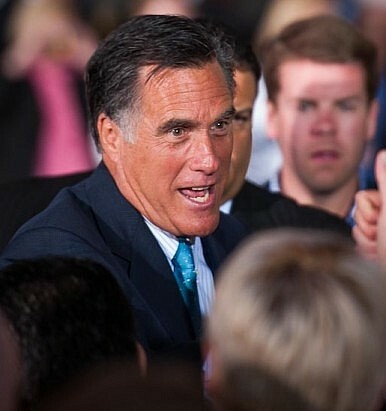 “On his first day on the job, Romney is not going to put himself on the immediate defensive with the world’s second largest economy,” one financial industry executive who supports Romney told Politico.